Annalise Crow, left, and Claire Mitchell described the Sisters of St. Joseph of Carondelet as “super sweet” and welcoming on a visit to their Motherhouse on Feb. 2. Rachel Schaefer had a simple question after Sister Maryellen Tierney, CSJ, shared her vocation story. "How did you know?" the Holy Cross Academy seventh-grader asked. "That's a good question; how does anyone know?" said Sister Maryellen, who attended Catholic grade schools and Rosati-Kain High School before entering the Sisters of St. Joseph of Carondelet in 1957. A depiction of Jesus Christ's crucifixion resonated with her. "If God can give up His life for us, what can I do for Him?" she concluded, adding that a religious sister told her about "choosing" religious life. "I always remember her saying, (that God said,) 'You have not chosen me; I have chosen you.'" For the Holy Cross students, God's choice might not be evident for another five to 10 years ... or longer. Still, the idea is present even now. "I really like to serve others, and it's really cool to see all these women working together and making this amazing community," Schaefer said. The "amazing community" put the possibility at the forefront on Feb. 2, which was the happy convergence of Catholic Schools Week and the World Day of Consecrated Life. About 100 girls from the Holy Cross Academy middle school at Annunciation Parish spent the morning at the Sisters of St. Joseph of Carondelet Motherhouse in south St. Louis, learning about the sisters and their mission of "Serving our neighbors without distinction." Meanwhile, the middle-school boys visited Kenrick-Glennon Seminary. In addition to vocation stories, the Holy Cross students learned about the prayer lives at each venue, ministries and the rich history of each in the Archdiocese of St. Louis. The seminary traces its beginning to 1818, after the Vincentians' arrival in Perryville. The Sisters of St. Joseph came from France about 20 years later. They established St. Joseph Institute for the Deaf in 1837, St. Joseph Academy in 1840 and Fontbonne College (now University) in 1923. Schaefer called the visit "really interesting. ... I'm really glad I had chance to come here today and experience this." Likewise, sixth-graders Maeve Conboy, Annalise Crow and Claire Mitchell gave the day the thumbs-up. "Everyone here is super sweet," Crow said. Mitchell agreed, saying: "They want everyone to feel welcome." Sixth-grade language arts teacher Katie Bourne helped organized the excursion. A 2007 St. Joseph's Academy graduate, she described the sisters as "really special to me." 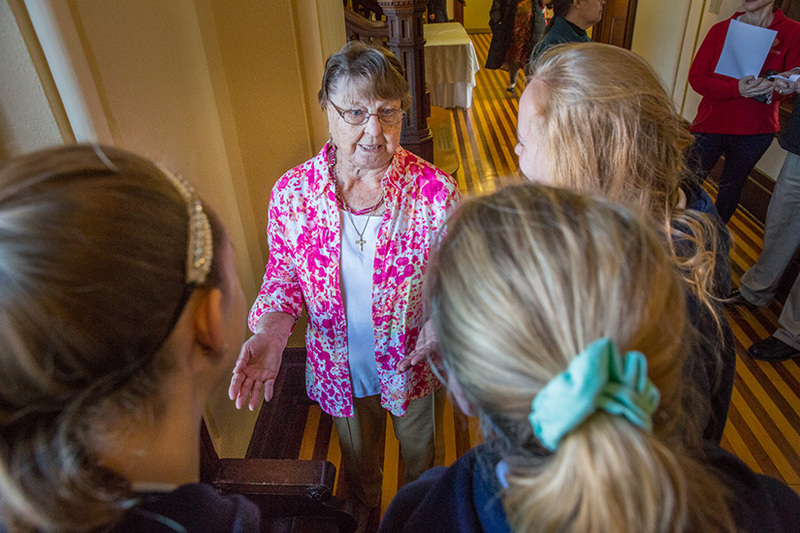 Plus, she wanted the Holy Cross students to experience the sisters and motherhouse firsthand. "A lot of (the students) don't know they're here." Years ago, Catholic school students encountered religious sisters and priests as teachers and administrators on a daily basis. A few schools in the archdiocese have religious sisters or priests in key roles today, but most have primarily lay faculty, administrators and staff, making the encounters between students and religious rare. By happenstance, Crow once met a religious sister at a secular bookstore. They got to talking, and the sister described religious life as "cool," Crow said. Though some people mistakenly equate vocations strictly with consecrated life or priestly life, vocations also include married and single lives. Sister Clare Bass of the CSJ Vocations Team stressed to the Holy Cross girls that vocations encompassed all of these things, telling them that vocations are about "being our best selves: be your best, and let God do the rest." "I wanted to make sure the girls knew to find a vocation that's a good fit for them," she said after the visit. "It helps them understand they don't have to have so much pressure to be this or that; all vocations are good. You just have to trust in God, and He'll find the path that's best."